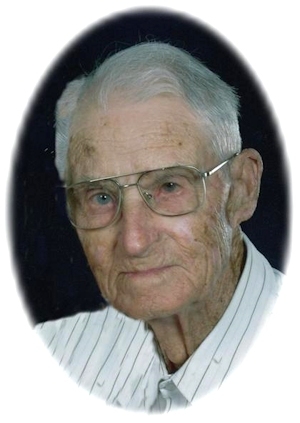 Obituary – Gottschalk, Walter August « Perry High School Alumni Association, Inc.
Walter Gottschalk, 96, of Perry was born on August 5, 1913 in Perry, Oklahoma to Ernst and Linda (Swartz) Gottschalk. He passed away on Saturday, February 6, 2010 at Perry Memorial Hospital. Walter married Clara Heppler on April 25, 1936 in Perry, Oklahoma. He was a member of the First Baptist Church, where he served as a deacon and taught Sunday school for many years. Funeral Services will be 10:00 a.m. Wednesday, February 10, 2010 at the First Baptist Church. Brother Aaron Summers will officiate. Interment will be in Grace Hill Cemetery. Services are under the direction of Brown-Dugger Funeral Home. The family will receive friends from 6:00 p.m. to 8:00 p.m. Tuesday, February 9, 2010 at Brown-Dugger Funeral Home. Memorials may be made to the First Baptist Church in the care of Brown-Dugger Funeral Home, 1010 North 7th Street, Perry, Oklahoma 73077. Walter is survived by his wife Clara, of the home; one son Donald L. Gottschalk and his wife Sue of Wheatland, Missouri; three grandchildren Jon and Heidi Gottschalk of Chicago, Illinois, Ronald Gottschalk of Las Vegas, Nevada, Gail and Brent Cook of Cedar Rapids, Iowa; six great grandchildren Augusta Cook, Georgia Cook, Perry Gottschalk, Kaelyn Gottschalk, Harrison Cook, Leandra Gottschalk. He was preceded in death by his parents, Ernst and Linda (Swartz) Gottschalk; one brother Carl Gottschalk; one sister Ida Smith.